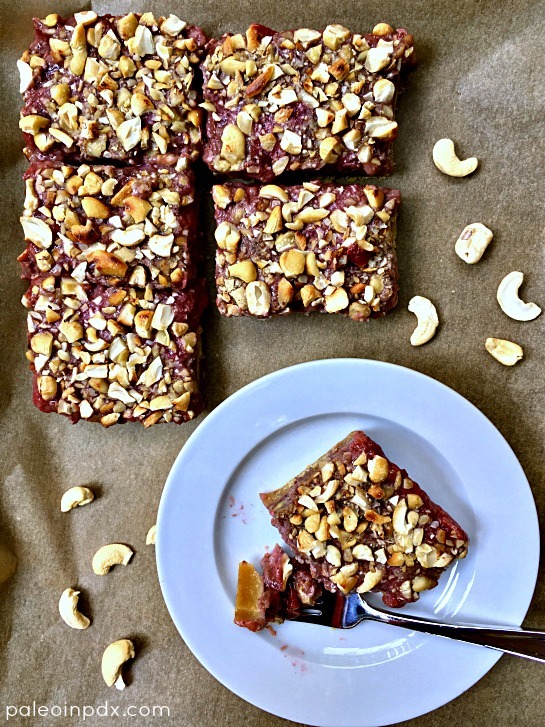 These cashew butter and jelly bars are something special and my inner child is especially satisfied by this delightful treat. These take me back to PB&J days as a kid, something that was often a staple in my lunchbox. Mom almost always used homemade jam and her strawberry was my favorite. It was probably the sandwich I ate most growing up (side note, but I also used to like bologna and ketchup sandwiches). Back-to-school time isn’t too far away and that’s what inspired this rendition of a classic creation. I don’t have kids of my own (I do have two fur kids though), nor do I plan to have kids, but that doesn’t mean I can’t have a back-to-school treat! But, back-to-school or not, kids or no kids, these are wonderful anytime and for all. Also, I will be featuring this recipe on KATU Afternoon Live later this month, so stay tuned! UPDATE: watch the replay of me making these on KATU Afternoon Live HERE. Feel free to experiment with almond or sunflower seed butter, if you prefer. If you eat and tolerate peanuts, you can even use peanut butter, of course. The cashew butter is so good in this recipe though and a nice change of pace — at least for me (I really don’t eat cashews or cashew butter very often). The strawberry filling is so fresh and jammy tasting, but not overly sweet. And, overall, the bars as a whole are not too sweet either. If you ask me, these are just right. Add strawberries and honey to medium saucepan over medium heat. Mash strawberries with a potato masher to break up the large pieces and release juice. In a small dish, dissolve the arrowroot powder into the water. Then, once the strawberries are mashed, but still a bit chunky, add the lemon juice and dissolved arrowroot mixture, and stir. Simmer over medium-low for 10-12 minutes, stirring occasionally. Remove from heat and set aside. In a food processor, gently pulse together the coconut flour, coconut sugar, and sea salt. Then, add the coconut oil, cashew butter, eggs, and vanilla. Pulse until mixture forms a ball. Press dough into bottom of 8×8 pan with fingers (note: greasing pan isn’t necessary, but feel free to line with parchment paper for super easy removal, if you like). Bake in preheated oven for 15-17 minutes or until light golden brown. Remove from oven and pour strawberry filling on top. Then, dollop cashew butter on top in teaspoon-sized increments (8 tsp total). Gently swirl cashew butter around with a chopstick or spoon handle. Sprinkle with the chopped cashews and the Himalayan salt, if using. Bake for another 20-25 minutes or until strawberry topping is warm and bubbly. Let cool completely (about 2-3 hours) and then cut into desired-size squares. Store any leftovers in an airtight container in the refrigerator.